Nikon is hosting a series of hands-on preview events across Japan for its recently-announced D3 and D300 cameras. Today, Zak and Shimada-san joined me for a trip to attend the event in Osaka, which started today and runs through the weekend. I thought it'd be nice to head down in style, so after some excellent ramen on the 10th floor of Kyoto Station, we took the fastest class of bullet train (Nozomi #17) which made the trip in just 14 minutes, hitting 253 km/h (157mph), according to my GPS unit. I thought the maximum speed would be faster (the new maglev trains being tested can go well over twice that speed) but it was fun and fast nevertheless. We received a pamphlet and a piece of candy (?) and waited in line for 10 minutes, and, to our delight, they opened the event 15 minutes early. 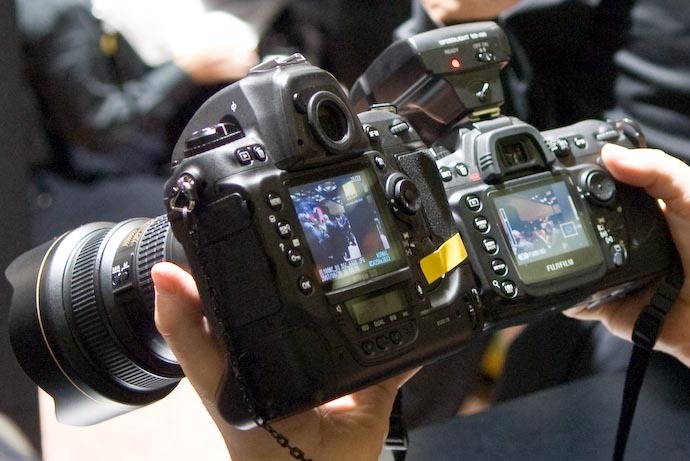 A kiosk with half a dozen D3s and as many D300s, for hands-on play. You were not allowed to put your own memory card in, as the slot doors were covered with a small strip of tape (in Nikon yellow, no less). It would have been a fairly simple task to slip your card in when the staff wasn't looking, but unfortunately, I suffer from a slight touch of integrity. They had a lady playing a harp under bright studio lights, where you could use a D3 (or D300?) 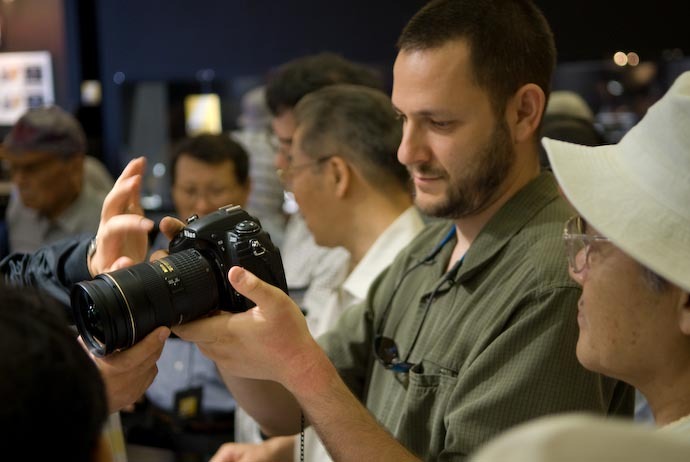 to take shots, then have one printed for you (Epson was there as a Nikon partner). 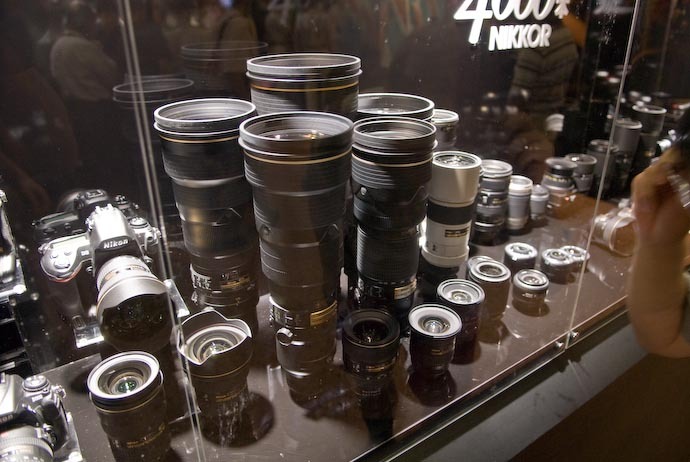 A long display case of lenses... perhaps every lens in current production? There were a lot of lenses. The recently-announced super telephotos were there as well. Yum. They had huge poster-sized printouts of D3 pictures from the same shoots as the online sample images. 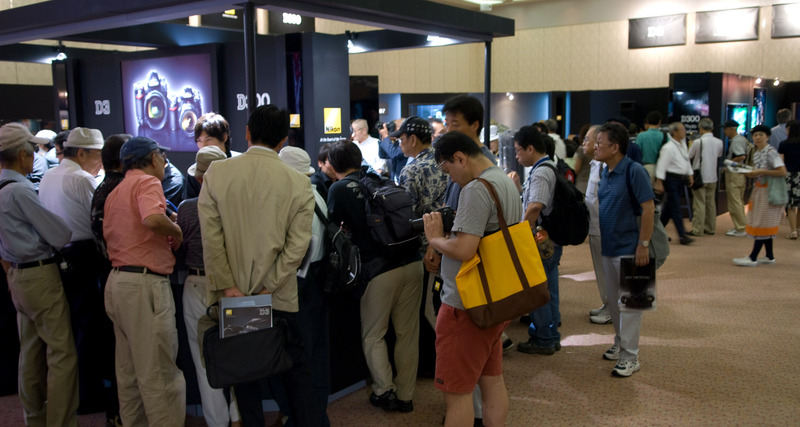 They had a little theater/presentation area, where Nikon people spoke about, well, I suppose, cameras. In what might be the most colossal waste of space ever recorded, they had a small display of their consumer point-n-shoot cameras, and some accessories like camera bags. I've been sort of mulling about the idea of getting a D3, which has many more/better features than my D200 or the new D300, but it also has some drawbacks. I started a thread on DP Review to catalog the list of D3 disadvantages to the D300, and one that's really worried me was the D3 size. It looked to be huge. But it's much bigger than even I worried. It's HUGE. It's MASSIVE. My walk-around camera bag is a Lowepro Off Trial 2 with the side lens cases removed. It's big enough to easily accept up my D200 with Nikkor 17-55/2.8 with lens hood attached (the combo seen in the first big picture on the post about my tripod). I really like that it just swallows up the camera and lens with lots of room to spare all around, making it a breeze to whip the camera out, and simple to just drop it back in. Despite the size, the D3 was not as heavy as I expected. The 17-55/2.8 is a heavy lens, weighing about as much as the camera itself, so a D3 with a light lens like an 18-200VR seems airy and light to me. I liked how the D3's viewfinder protrudes out from the back of the camera, because my nose didn't rub on the screen when I looked through the viewfinder. With my D200, my nose rubs. They put on a 17-55/2.8 for me (my favorite lens), which happens to be a DX lens, and I put the camera into manual FX mode. At 17mm, you could clearly see the image circle projected onto the larger sensor, with black all around, but by about 24mm there was only a bit of dark in the four corners. Beyond that, the image covered the entire FX sensor. I don't know the quality of the image out to those edges, but it bodes well for using a DX lens on a D3 in FX mode. I couldn't get the Live View to work, and didn't really care enough about it to ask. I would be very interested in it for the accurate focusing while on a tripod, but that's probably about it. My second big worry about the D3 is that it has all the autofocus points crammed toward the center of the frame, so that they can all be used even while the camera is in DX mode. Indeed, when in FX mode, you don't get an AF point outside of the center cluster, which I think is a huge drawback. As it is, I wish my D200 had wider AF-point coverage, so moving up to a D3 would be a big step down in this respect. After all the hype, I was a bit disappointed in the high-ISO quality of the D3. I compared an ISO 1600 shot on my D200 with an ISO 6400 shot on the D3, and they seemed comparable (which means comparably bad, since the D200 at ISO 1600 is pretty bad). Being comparable at two stops faster is an amazing feat, but after all the hype, I wanted ISO 25,600 to look like it was rendered by Pixar. In the end, I was looking for an excuse to not get the D3, since my D200 is still as awesome a camera as it was before the D3 was announced. If the D3 could have washed my windows and given me a massage, I'd have reconsidered, but since it doesn't, I'll concentrate on understanding my D200 better and wait to see what Nikon brings us in the years to come. We were looking at the D300 together, comparing it with my D200, and taking pictures of the nearby harp-playing lady, and comparing, and taking more pictures. At one point, I realized that we'd moved away from the kiosk, and that absolutely no one was paying attention to us or the camera. The staff, back at the kiosk, were all engaged in conversations by the surrounding horde. For easy identification, the cameras had a yellow cardboard square attached by a short length of chain, but trust was about the only deterrent to theft. Without telling Shimada-san, I stepped back to take the picture above, then I told him to look where we were. We laughed and jokingly cursed our honesty, and returned the camera to the scrum. So you would say that neither the D3 or D300 offer really great shots at high ISOs? Compared to D80 and D200? For instance if my D80 shoots “okay” but grainy shots at night at iso 1600 what could I expect from a D300 with the same settings and light level? I’m not considering the D3, but I am thinking of going from D80 to D300, so I’d love to hear more information about the D300. Mmmm… ramen and cameras, a perfect day. 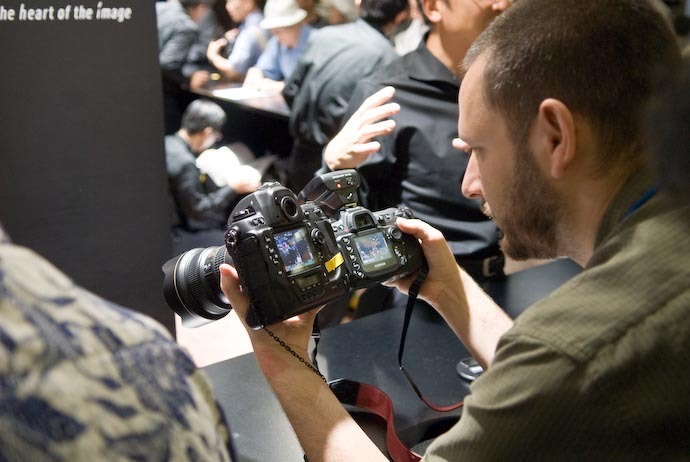 The jump in price from the D200 to the D2X (and now from the D300 to the D3) has always given me pause. That’s a lot of extra money to spend! I never found the extra money worth it. Maybe if I could bill it to some big-pocketed clients. But no, I’m trying to make a profit, so I’ll keep with the smaller camera. Also the size of the D3 is just crazy to me. I guess in the end, I am a 35mm shooter — I like being able to lug the puppy around without involving a winch. Yeah, no kidding about the size! I had a D1 and later a D1x before they started making smaller ones I liked (hello D200!). The D200 is much much nicer for casual use. It being lighter and smaller for carrying around is nice, but the best part really is that it doesn’t look completely INSANELY GIGANTIC and intimidating for the poor subjects. 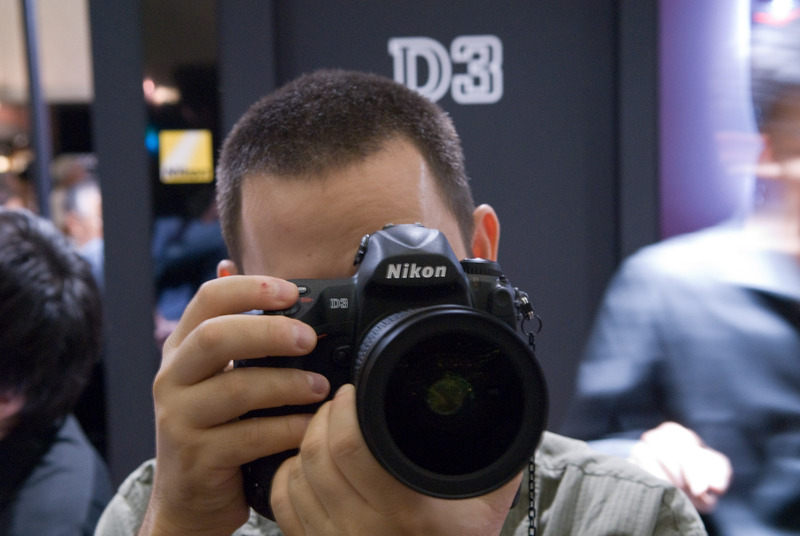 I was thinking about buying a Nikon D3, but after reading the review it’s making me think twice about it. 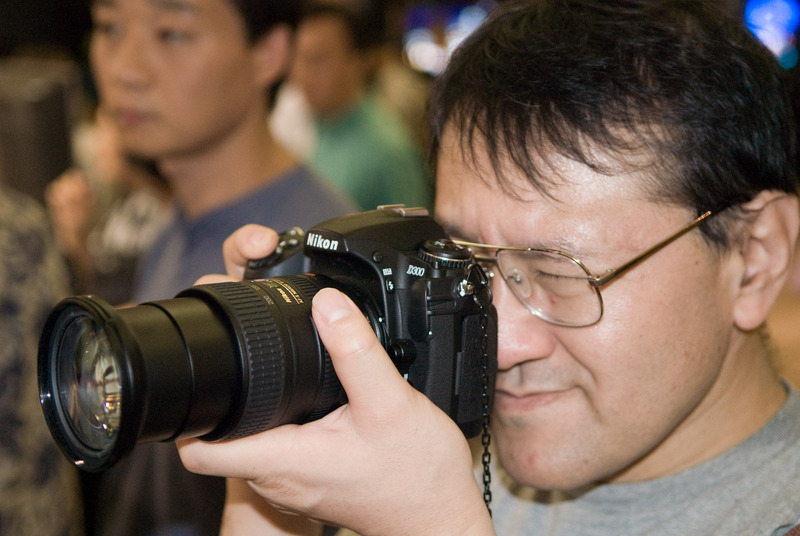 Maybe just buy the Nikon D300 and a nice lens. I personally like a large camera, but I understand a lot of people don’t. What I don’t get though is your concern that the camera “barely” fit in your bag. Either it fits or it doesn’t. It’s that simple. “Either it fits or it doesn’t” is something someone who’s never used a camera bag would say. There are degrees to how easy it fits — how easily it goes in and out — which has a direct influence on how enjoyable it is to use on a moment-by-moment basis. And in your case, it clearly does fit. If you want to travel small, then you should be glad that the bag isn’t much bigger than the camera. Think about it. 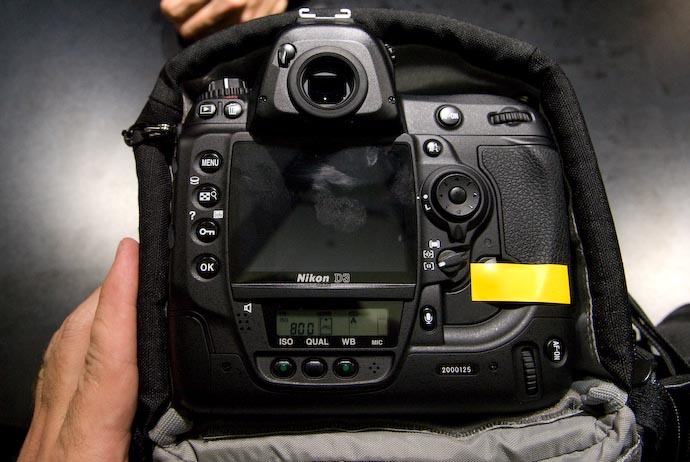 You could be travelling with a D3 using the same bag that you used for a D200. Sounds like a good thing to me (except for weight concerns). Ha, I just came over here to see if your “Must have a D3” countdown clock had started only to find that you had already had your hands on one. Waiter, drool cup for Mr. Friedl, please! Jeffrey, you want to go to Kurama Fire Festival on the 22nd? I forgot to link to the really cool gallery of wedding photos that I saw. You should absolutely get the D3 [*]! I’ve seen the amazing resolution of photos coming out of canon 5D and pro canons, and certainly the D3 should be able to do the same. Since you have the high end lenses, you should match them up with something that can take full advantage of them (personally, i use a D40 and the tiny 55-200vr lens). About the weight, i can tell you this: One of my former roommates had a D1x, and never kept it in a bag. He said that it was basically bulletproof, so it could roll around in a car backseat with no problems. When actually in use it didn’t seem heavy at all, since both grips were so well designed. [*] easy to say when I’m not the one spending the $$! I’ve purchased a D300! Check out my blog for a comparison shot of high ISO vs my D80. I’m in love! I own D3. It is a phenomenal camera. It really feels like my F3, and I upgraded from a D200. I shoot in a lot of low and natural light and it has made a difference in my getting the shot. The bag question. I can not find a bag that works. The viewfinder is HUGE., and does not make it into any bag well, except my old Domke. This is especially true of small bags you use to just tote the camera with one lens on. Hopefully LowPro or Tamack will see the need soon. I have been the proud owner of the D3 for nearly a year now. I keep on asking myself how can Nikon improve on this camera. Then they brought out the D3s and the D3x. Still the D3 will be more than a good work horse for me for a few years yet. Maybe I will be saying the same about the D4 in the next couple of years.